Tozeur is a city in Tunisia. You can get an overnight train from Tunis. Many long distance buses also run south to Tozeur. Tunisair also flies a few times per week to and from Tunis. Taxis are unmetered in Tozeur; you will have to agree on a price before the journey begins. Prices should be around 2 dinar for a short trip (around a kilometer or less), and more accordingly. Another option is in horse drawn 'carriage', though this is more of a tourist experience than a typical means of transportation. These carriages give tours of the city and nearby date plantations, should cost 10 TD for an hour. Bicycle rental is also common, and an excellent way to explore the impressive palmerie. Test ride the bicycle before paying, and investigate if there are better/newer bicycles then the one offered - you are rarely offered the best bicycle. Haggling and visiting several rental shops is recommended. Many people who come to Tozeur do so for the three abandoned villages nearby, Chebika, Tamerza, and Mides. These three villages are easily accessible through the numerous local tour operators who sell seats per person to these villages and many other local attractions. For a half day trip, expect to pay 40-50 dinar per person. The 4x4's hold 6+ people, so if you have a group of four or more, simply hire the whole 4x4 for yourself - about 200 dinar (with some negotiation this can be reduced to under 150). The allure of these three villages is that they were abandoned during floods in 1969, and offer a window to what life was like in oasis villages back then. In reality, the mud and stone buildings are unoccupied and falling down, tourists swarm the sites in hordes, and local children will offer to sell you crystals throughout your journey. The sites are still worthwhile, though the journey there may be more spectacular than the villages - you drive into the Atlas mountains, and are only 1 km from Algeria. Multiple natural swimming pools and waterfalls are along the drive. Bring swimming trunks and a towel. If you do go, and are up for a hike, a beautiful 4.5 km gorge runs from Mides to Tamerza, and is worth the walk. Hiring a guide should cost no more than 40-50 dinar total (per guide), though they may price the hike per person. Syndicated, official guides may (or may not) be found at Mides, and/or the Syndicat d'Initiative along the main road, which has various hours. Attempt to contact them before hand-one number given for them is 76-485-288. If you start the tour in the afternoon, begin the hike as early as possible, to allow for any problems or twisted ankles. The gorge will get dark long before the surrounding area. If you do use a tour operator for transportation, it is recommended you pay half up front, and get a receipt that includes words like 'seatbelts' and 'driver speaks english' and anything else you find important. All this may be promised, but if you pay in advance in full, it will probably not be delivered. If you have your own car, or a rental car, there is no reason you cannot do most, or all of this journey. All but a 100 m shortcut to Mides is on paved roads, and if you simply do not take the shortcut, you will be fine. Getting lost is nearly impossible, and following the massive number of tour companies will get you to the sites. 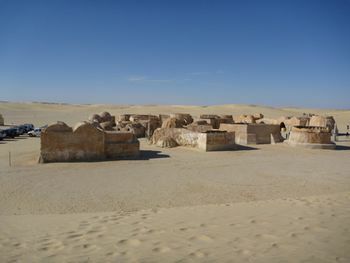 This site was used for multiple Star Wars movies. Scenes in the town 'Mos Espa' or 'Mos Eisley' have been filmed here. Tours are available from local guides. Prices should be about the same for any half-day tour from Tozeur. One of the largest palmeries in Tunis. The nearby Chott el-Jerid is an impressive lake, completely dry for most of the year. Few people speficially make an effort to see this, as anybody driving to Douz will drive along a raised causeway over the lake bed. Have your camera handy. Go on a camal tour. One reputable operator is Amara Themri (tel +216 97280133 / 23 131 483). As always, pay for a one-hour tour before you embark on a multi-day tour if you have never ridden a camel before. Enjoy the Hammam. Hours vary, as the local Hammams accomodate both men and women in a single Hammam, though not at the same time. Hammam Shabia is recommended, and is just north of Hotel/Residence El-Amen. Bring your own towel and soap, and bathing suit, as people wear this or their underwear in the Hammam. 2-3 dinar for the Hammam, and 2-4 dinar for a massage, though the 'tourist tax' may raise this price to about 8 dinar total for everything. Tozeur has several restaurants that feature Camel, or Dromedarie. If this interests you, now is your chance. Camel has a flavor similar to that of Lamb. Camel is offered with couscous, or as a steak or kebab. If you are looking for Alcohol, you must head to a bar in a tourist hotel. Many restaurants serve non-Alcoholic beer, including the popular Turkish beer, Efes (which normally has alcohol). Most hotels are located along Ave. Abdulkacem Chebbi, about 700 meters south of the bus station. A taxi from the bus station should be no more than 2-3 dinar. Once you investigate one hotel, it is easy enough to walk to a few others. Street numbers for this Ave run West to East, with the lower numbers to the West. A small internet cafe is located 30 meters south of the bus station. Trains leave to (and arrive from) Tunis twice a day, usually very early in the morning (at 6 am) or in the evening. Busses run 3-5 times a day direct for Tunis, on a 7 hour, 26 TD drive. Generally, taking the train (in 1st or Confort class, around 30 TD) is a much better option than the bus. If you are heading south, you can take a bus direct to Douz or Gabes. For the louage, transport south to Douz requires a change at Kibilli (Kebili) and from there to Douz. Each leg should take just under 2 hours, though the wait in Kibilli may be 1-2 hours for another louage. Louages are more frequent before mid-day. This page was last edited on 20 March 2018, at 09:35.